From Puerto Sherry (Spain), we went to Portimão (Portugal). Our goal was to ensure that the boat was working well after all work that had been done – especially on the steering gear, before going to the Canaries Islands. Everything worked good and after some hopefully final tuning in Portimão, we would leave Europe behind and reach Rabat in Morocco. So, we went first to Culatra island close to Faro in Portugal. We left Puerto Sherry with the perfect conditions to test our new staysail (25 knot of wind at 60°), my uncle (also a sailor) crewed in for a week; we were all happy to have a new crew member with us during the overnight crossing to Culatra. Culatra is a small sandy island with a huge beach facing the Atlantic. Pierre planned the crossing to arrive in Culatra early in the morning at the right time for the tide in order to get safely into the river canals. He did a great job and we arrive there when the sun was rising, with good conditions to enter the place. We spent a couple of days in Culatra before leaving for Portimão, we had our last swim for the season and we enjoyed the village. Culatra is very nice place. It surely is like today like it was 20 years ago; it looks like tourism has not arrived there yet – at least at this time of the year. 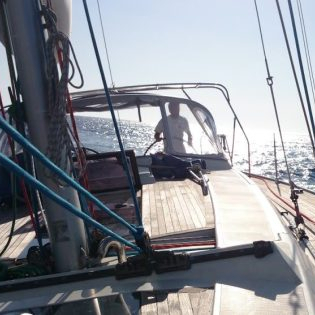 From Culatra, we went to Portimão, our initial plan was to go directly… but winds and currents were against us and after 4 hours sailing only 10 nautical miles of the way, we decided to go and drop the anchor close to Villamaoura (where we “enjoyed” the Atlantic swell). We knew the next day the wind would be pushing us… so why suffer more? We arrived to Portimão in no time the next day. My uncle left us and we had the chance to have a double doctor visit. Pierre had an infection (resulting from the broken tooth that we had no time to repair in Puerto Sherry) and I had a lipoma under my hair on the top of my head… so we gave a try to the public hospital but when they announced that we had to wait for 8 hours, we went to see a doctor in a private medical center (our kids where waiting with us). In less than 2 hours (and some euros) we were all good to go back to the boat. We picked-up an Iridium phone we got second hand on ebay, and we were ready to go. A traditional mindset is clearly predictive. By predictive, we mean that you set your goal and then you (try to) plan painstakingly everything to meet your goal. We can also say that we have established an agile mindset in our relationship with the kids, we are proud of our efforts in applying/trying positive discipline with them: we try to treat them with respect (the same respect we have with other adults, and the same respect we expect from them), we take their opinions into account (we want them to be part of what’s happening to them) and we try to teach them by the example. Teaching by the example is probably the most challenging aspect of positive discipline, especially when we are tired or busy. We are still having our family weekly retrospective and kids are keen to participate. We have to congratulate our crew: these weeks, most items on the agenda are coming from them! The passage from Portugal to Morocco went fine. We topped up the diesel tank in Portimão and left with good winds. Huge dolphins came to salute us and warned us about the strong winds coming straight from Gibraltar (20+ knots). We had a fast night (7 knots on average) with just the staysail and 2 reefs in the main; big waves, roller-coaster night, but we felt really safe with our new sail because we know that with this setup we can handle a lot more wind. This is exactly what you want for the night: to be ready for the unexpected, you don’t want to be running on the deck to take a reef or furl in the jib. The second day was fine, the sea calmed down as we were getting really south of Gibraltar and closer to Morocco. When the second night came, we set on a direct course to Rabat, moving at 2 knots on a flat sea. 2 knots was good to get to Rabat at the right time for the tide. We motored the last 2 hours, we raised the Quebec (Q/Yellow) flag for the first time and we called the Bouregreg Marina on VHF to get their assistance in entering the River/Marina (everyone has to do it, and we really appreciated being guided in the “Bou Regreg” river).